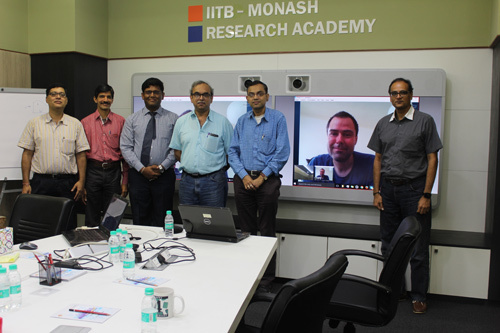 Prashant Agarwal, a research scholar with the IITB-Monash Research Academy, defended his PhD thesis successfully on 20th July 2016. His research work concentrated on microparticle manipulation through low frequency capillary wave excitations. His supervisors were Prof. P. S. Gandhi of IIT Bombay and Prof. Adrian Neild of Monash University. Prashant has been attempting to understand the movement of particles towards the collection region using an open rectangular chamber undergoing vertical and horizontal vibrations. The ability to manipulate particles in a fluidic environment is crucial in many fields to accomplish tasks such as enhanced sensing, collection, concentration, and sorting. This work is particularly relevant in biological sampling, and can be used to extract and concentrate cells and target particles to certain locations for analysis. “The idea of exploring in depth a field not understood previously intrigued me. The link between this technique and the state-of-the-art methodology is particularly exciting,” added Prashant, who is now pursuing post-doctoral research at the University of Iowa, USA.